I was commissioned to design a sign for a house called La Casa del Sol, which could also be used as an image for business cards by a lovely lady who is a ’Lightworker’. She wanted a representation of the sun, sky and sea in the form of a mandala, painted in bright, positive colours. Having researched the client’s ideas I made small preliminary sketches, developing the one which stood out as being particularly harmonious into a larger line drawing, which she approved. She also decided on the size and shape of the sign at this point and approved the colour samples I’d made. I painted the sign on primed marine plywood in gloss paint, using several coats of varnish to make it weather proof and used a simplified version of the sign for the business cards. The client was delighted with the results. 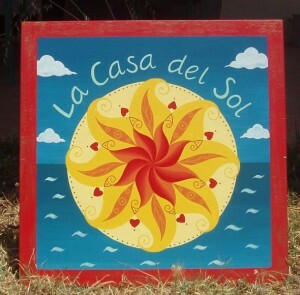 This entry was posted in murals & signs and tagged casa del sol, gloss paint, mandala, marine ply, painting, sign, sun by kathrynhockey. Bookmark the permalink.